Our Captain has signed off on his log book for the final time, boarded the “Algoport” and has set a course for calm seas with a clear horizon. Gerry leaves ashore, his wife of 42 years Susan; his children Sabrina (Craig) and Marc; his dear sister Joan, his brother James (Bonnie) sisters-in-law Valerie (Michael), Raechel (Wendell) and Ann (Paul-deceased) along with their families, as well as countless friends and colleagues. He was predeceased by his parents Cyril and Muriel Kranenburg, his sisters Elizabeth, Anne and Zandra, his brothers Paul and Dickie, as well as other dear relatives. The family would like to thank his caring and compassionate doctors of many years, Dr. Sandi Ennis, Dr. Michael Furey, Dr. Vickram Chandurkar and Dr. Craig Stone. We would also like to thank Dr. Mary Wells, Dr. Mary O’Brien and their teams. In addition the wonderful team of Nurses and Staff of 4 North B Special Care Unit and the ICU during Gerry’s six week illness. Cremation has take place. There will be no visitation or services as per Gerry’s request. In Lieu of flowers, kindly please donate to the Canadian Diabetes Association or to The Mercy Hospital in Georgetown, Guyana in his memory. Please raise a glass to celebrate “The Big Guy’s” life. Go Manchester United! Thank you everyone for your kind expressions of sympathy, your memories and your kind words. Keep the Faith! It was with great sadness that we heard of Jerry’s passing. We had lost contact over the past years but we never forgot Jerry. He was one of a kind. Our Sincere Condolences, Gerry was my first Captain and I learned a lot, no only about ships, but about life from him and our Algoport Family. It is still a fond memory and an honour to be in the group of people who sailed in the ship under his command and were Gerrys Kids, the majority of whom all went on to be leaders. I just learned of Gerry’s passing. My sincere condolence. Our sincere condolences, we are saddened by Gerry’s death. Gerry was more than a coworker, he was my friend. I will always cherish the time I worked on the Algoport and how Gerry never forgot you when you left. so sorry for the loss of your husband and Dad. Sue, it’s been a while since we have been in touch however I always remember you fondly. Thinking of you and your children during this time. We were shocked and saddened to learn of Gerry’s death. Please accept our sincere condolences. Susan, Sabrina and Mark my sincere condolences. Gerry was special, he was funny and sincere. We will all miss him. Hope you don’t mind Gerry but I use your saying “Keep the Faith”. When we talked it was always the way we ended our conversation. I’ll miss you my friend but I will see you again. I believe “Faith” says so. Big hole that I can’t see anyone else quite filling. Best 3 years of my sailing career was 1st mate with Gerry on Algoport. I didn’t want to leave and I know he didn’t want to see me go. Felt like home to me there. His impact will last a lifetime. I think there’s still a bit of Crown Royal left in our cabinet for his next visit. I know that when the Algoport was lost it broke his heart but not his spirt, but she lives on in our hearts as will Gerry. Condolences to you Susan, and your family. I think of him often, always with fondest memories. Fair winds to you on your final voyage Cap’t K.
Gerry will be missed by his many friends at Algoma and I will personally miss his regular phones call to the office where he updated me on how well or how poorly my soccer team was doing. We are very sorry to hear of Gerry’s passing. He was certainly one of a kind and won’t be forgotten. Our thoughts and prayers are with you during this sad time. We will raise a glass. I will miss his phone calls. I never had the pleasure of meeting Gerry however we had some lovely phone conversations. The most recent being about his Sabrina moving to Halifax to take ASL. He was asking about living accommodations and was most concerned that she be in a safe area. His love for you his family always shone through. I will miss our chats. Dear Susan, Sabrina and Marc. It is with sadness that we have learned of Gerry’s passing. We shall surely miss his phone calls, his keeping us all up to date on family and friends. We are sadden by Gerry’s death and we will miss him.Our thoughts and prayers are with you all at this sad time. Sincerest condolences on the lose of your husband and father.Thoughts and prayers are with you. Keep your memories close. Bob and I are so sorry to hear of Gerry’s passing. Please accept our condolences and our thoughts and prayers are with at this time. Please accept our condolences on the loss of your husband and father. May you find peace in the love of family and strength in the caring words of friends. We are deeply sorry with Gerrys Passing and our Prayers go out to you and may the many fond Memories help you through this difficult time..
Sincerest condolences on the loss of The Captain. May memories comfort you all in the difficult days ahead. Love and hugs to you all! We are deeply sorry to hear about Gerrys Death. He was a very special friend. Our deepest sympathy to Susan, Sabrina & Mark. Our thoughts & prayers are with you at this difficult time. Susan, Sabrina and Marc: We were saddened by the news of Capt. Gerry’s passing. The many lengthy telephone conversations will be missed as will his “counselling” on life itself. We can only hope he is peacefully afloat in heaven with a phone at his side and a glass of good scotch in his hand. Our thoughts are with you and we wish the many fond memories of a man “larger than life” will sustain you through this difficult time. In the Captain’s honour, we will continue to observe his gentle reminder to “keep the faith”. Susan…please accept our sincerest condolences for your loss .Gerry was always a force to be reckoned with and will be missed. Susan, Sabrina, Mark. Sorry to hear about Gerrys Passing, will have that drink of Crown Royal in his memory. LIke he would always say to me Keep The Faith. Susan,anything comes up and you need a hand please do not hesitate to Call. I am so truly sorry to hear that Gerry has passed. Having known him personally through my family and through my years working at Algoma Central Marine, I know he was loved and respected by so very, very many. 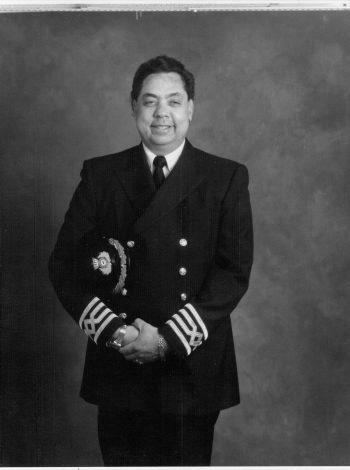 Gerry took great pride in being a Captain and the M/V Algoport and its crew were as important to him as his own family. I know he truly mourned the loss of the M/V Algoport when it was lost near Japan. But Susan, you were his greatest love. Sabrina and Marc, your father loved you more than you could possibly ever know and he was so very proud of you both. Please accept my deepest condolences for your loss and know that you are in my thoughts and my heart. And Gerry, I know that wherever you are, you will always KEEP THE FAITH. Rest in peace Captain and friend. Thoughts and prayers for the whole family. Remember the good times and cherish all your memories. He will forever be in your heart and never far for a good ‘chat’. It is with great sadness Elizabeth & I learn of Gery’s passing. The heavenly welcoming committee are at the ready with Hughy MacD and Brian R leading the way welcoming him in. Marc and the Kranenburg family. Sorry to hear of your husband and fathers passing.May all the fond memories of him get you all through this difficult time.May he rest in peace. I am so sorry for your loss, may he rest in peace. I am so deeply sorry for your loss. I hope that you find some comfort in your shared memories of Mr. Kranenburg and by knowing that he is at peace.